There's interesting footage surfacing which shows an Orthodox Jewish man being brutally punished the fists of an angry man in New York. The footage shows the 62-year-old jew being brought to his knees with accurate blows in the middle of a Brooklyn pedestrian crossing. 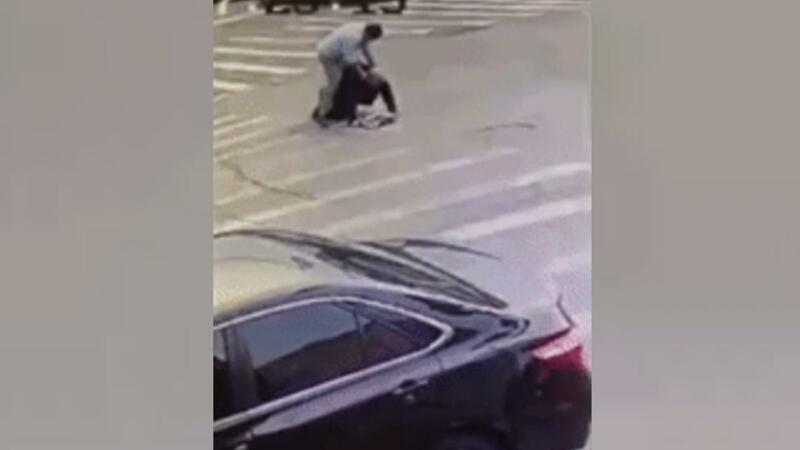 The powerful shots given to the apparently Orthodox-Jewish recipient of the beating were filmed by CCTV footage, and many want to know how it began. The altercation begins after a man appears in the camera's lens arriving by a vehicle near the Borough Park neighborhood at around 7:30 AM on Sunday morning. The area is known to be one where Israeli dual citizenship and shekels are plentiful. As the man approaches the victim, he strings a series of punishing blows to the face of the Hebrew eternal victim, with an iron-fisted elbow drop to follow after he rolls the Jewish Talmudist into the street. We clearly cannot be sure as to what the “victim,” the recipient of the attack has done to encourage the act of violence. A second Talmudic Jew, likely a New York Democrat, can be seen getting chased away by the New York champion. The video goes on to show the second Jewish person flee completely out of view. What's certain is that we'll never hear the end of this, and I can hear the “oy vey” from social media without even logging in. It's bad enough that all of Israel has been hated by all ever since King Solomon the Wise has fallen from grace as did his people. But rubbing salt to the collective wound of the Jewish people by spewing out unsubstantiated anti-Semitic crackpot theories and hurling unwarranted ridicule is frankly far worse bigotry than what the radical Left has accused us all of. My point is: you cannot chop down an entire apple tree all because of a few bad actors. There are shondas working against their own kind (you know whom I'm talking about, that damn Hungarian billionaire! ); ergo, we have a common enemy to fight against. cctv? is it possible this person attacked had a walk pattern known about that the speeding auto and driver was aware of to race in and target the older man… / odd posting part of a scene without some qualified research + more questions not confirmed.. hope there is further information . no sides to this article of whom or why or what may of been precursor to this hit… goldwater ? attacks on anyone do need to be deeply investigate before playing the public's sentiment.. fires are quick putting them out take a long time, even to find the cause.. complete the finds of the beinging of these involved . and what made the attacker go running after a onlooker trying to assist…. media has played the public along time … all of you know how messed messages cause more problems.. do you job fairly and more competent. please these are not times for messing with minds of the public.